Recently, the BBC commissioned a series of documentaries that would delve into the truth about calories, sugar, fat and your medicine cabinet. All topics that greatly interest me and many of you reading this too. I was excited to see the BBC take the opportunity to really lift the lid on these health concerns that have been causing so much confusion for decades. The calories episode was somewhat informative, though I didn't advocate the idea that even if you sit on your arse all day, your body is still burning calories just by living (through blinking, breathing, blood pumping around your body, concentrating, etc). That's definitely the message to get across to a potential audience who literally do sit on their backsides all day, stuffing their face full of c r a p, and help to make up the ever growing numbers of obesity. The sugar episode left me feeling rather irritated that they encouraged a group of sugar addicts to continue feeding their bodies with sugar - in the form of fruit (natural, yes. Healthier? Not really). One gentleman replaced all of his calories he would have got from sugar with calories from drinking beer. Slippery slope indeed, and still pretty much left his health in the same position as it was before he started the process. However, it was the episode on fat that really got on my nerves. As I mentioned, the BBC were in a truly FANTASTIC position to produce a 'groundbreaking' programme (in terms of the potential audience they were broadcasting the issue to), yet completely let so many people who are trying to prove that fat isn't the enemy. Not only that, I'm not surprised if they'll have left audiences feeling even more confused about fat. They asked a group of participants to live off food that contained no more than 1% fat for several weeks, meaning the participants became obsessive with reading the fat contents on food labels, surviving off things like water biscuits, fruit, processed meals and food that have had the fat replaced and instead pumped full of either sugar or sweetener for flavour. I'm down on my knees, hoping and praying that you, yes you, reading this knows far better than to eat this way. That 'low fat foods' are usually processed, pumped full of additives and have zero nutritional benefit for you and your health. The next time you head to the supermarket, head down the diary aisle and pick up a pack of 'low fat yogurts' - these Müller Light Greek Style yoghurts contain 9g sugar per 100g, so already not great. The fourth ingredient is fructose, and further down the list is aspartame aka, the sweetener used to make Diet Coke 'sugar and calorie free'. Not only that but this chemical is linked to weight gain, depression and increased cravings. If you fancy a yoghurt, stick to plain, natural yoghurt or real Greek yoghurt such as Fage's. Add sweetness with fruit and you'll be fine. Don't just read the nutritional information, take a look at the ingredient list too. Your mind will be blown! How I wish I had known this in my teenage years. Think of an avocado, or a pool of olive oil. They're rich and creamy and plump, right? Well imagine the affect they'll have on your skin once you've digested them! Plumper, nourished, glowing skin. I'm not talking lashings of butter and great big gluggs of olive oil, everything in moderation, of course. If it's good enough for Elle Macpherson, aka supermodel aged 51 going on 21, it's more than good enough for you. Hormones truly are so much more important to the function and wellbeing of your body than you'll ever realise, fact. 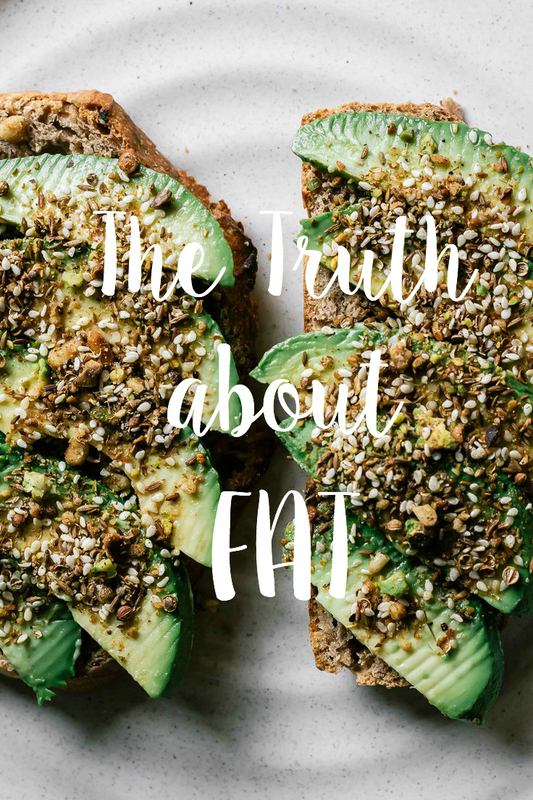 Cutting back on fat is going to have a detrimental effect upon your hormones, meaning they don't get released properly, meaning your body is functioning much slower than it should. Lack of fat could affect sleep, it could affect your fertility and menstrual cycle, and could affect your hunger hormones, meaning you may find your self feeling hungry even after eating a good amount of food thus causing mindless snacking and eating more than your body needs. Eating fat does not make you fat. Accept this. Fat helps you feel fuller for longer, and works even better when combined with a good source of protein, such as eggs and avocado for breakfast. Because sources of fat are so rich, your body will actually struggle to eat a huge quantity of it. Therefore, you'l find yourself only being able to eat small amounts, you'll feel much fuller and therefore less likely to snack or eat carb heavy, sugary foods. It is processed food, processed carbs and sugar in all forms that lead to weight gain, not fat. Promise. Did you watch any of the BBC documentaries? What 'diet myth' irritates you the most? How do you feel about fat? I wrote a similar post a few weeks back about how full fat is actually better for you than low-fat. After stripping all of the good fat out of low-fat alternatives and then pumping it full of chemicals they are actually less healthy than people think. I didn't see the BBC documentaries, but it's a shame that they didn't deliver a better message considering the potentially large audience watching. Great post! It's incredibly frustrating that people still don't seem to understand the actual difference between full fat and low fat, which is why it's so important to check the ingredients list too, as well as the nutritional information. I saw the programme too. I thought the one about sugar was very interesting. It is super crazy how much sugar people are consuming day-to-day. One thing I would say though, is the sugar in fruit is a healthier alternative because your body can't absorb the fruitose in the same way and so you'd find it hard to have too much which is why it doesn't count in your daily sugar intake. It is also packed with fibre, which slows down digestion, so you don't digest the sugar as quickly. The issue is when people drink juices instead of eating the actual fruit whole. They said in the fat episode, the one week the participants lived off 1% or less fat was not healthy, and the foods they were eating aren't good for you. It wasn't encouraging people to continue doing it, it showed how crap they felt and how miserable they became. All of the participants had to be checked to see if they could even participate health wise because it was so risky. It was an experiment, not a way of encouraging people to eat like that. Fat is good for you, but in moderation. Like everything it's all about eating a healthy balance of food. Oh absolutely, when they announced the participants had been eating huge, huge, HUGE amounts of sugar each day, it just seemed totally ridiculous! But it was great that they could recognise that it wasn't good for them and they were seeking help to reduce their daily intake. Although I totally agree that fruit is good for us as it provides us with nutrients and plenty of fibre, it is important to recognise that it should still be eaten in moderation, and vegetables are the thing we should be eating more of. At the end of the day, sugar is sugar. Some are more detrimental to our health than others. However it all gets metabolised in our body in the same way - if we don't use it, our body stores it as fat. Definitely agree that eating whole fruit is more important than shop bought juices! The main issue with the fat episode is that what wasn't highlighted and emphasised was how important fat is for us, and they didn't show where you can find these sources of fat and how beneficial for our health it is. Of course, it was an experiment to highlight how dreadful we would all feel with a diet of little to no fat. But I really wish they'd taken the opportunity to show how great fat is and what sources of fat we should be eating. Horray - I love my good fats - makes me feel so nourished! Exactly, low fat = sugar or even worse, artificial sweeteners. Great post, this is so relevant with our diet culture today. Exactly, and although this is now more widely spoken about, not enough people truly understand this. This was such an interesting read. Thank you. I'll admit I have some of those Muller yoghurts in my fridge *runs away to throw them out*. Georgina! Get them away now! Haha, trust me there are tastier things out there - if you reeeeally fancy a treat-y yoghurt, a brand called The Collective make amazing yoghurts - the raspberry flavour is oh-so-yum.